Front desk service is unfriendly. No wireless internet as stated. No com. breakfast as stated. The hotel was in a nice location. The rooms were a little worn and run down. When we first entered the room, the room had a smell like damp carpet or something but the overall experience with the stay was pleasant. The staff was really helpful and friendly. And my kids enjoyed their trip to sea world. The hotel was a little worn and run down. We had meetings to attend nearby, within 5 miles, the shoreline drive was thrilling everyday, and different each day also. The food (room service) was really creative and delicious. City of Del Mar was friendly and allowed us a place to walk on the beach and meet a lot of very nice people and their dogs. Parking fee. Our tub would not hold water. No Pets allowed. 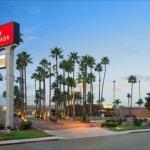 Ramada Inn & Conference Center, located near Qualcomm Stadium, boasts world-class service and hospitality. The popular attractions, including SeaWorld Adventure Park, Gaslamp Quarter, San Diego Wild Animal Park, San Diego Zoo, Seaport Village, Legoland and beaches, are minutes away from the inn. The onsite tour desk offers guided tours, sight-seeing itineraries and zoo/park tickets. Complimentary parking, wireless high-speed Internet, appetizers in the evening, hors d' oeuvres, 24-hr fitness pass, ice for team coolers and HBO are a big plus. Over 8,000 square feet of space is available for banquets and conferences. Bright elegant spacious suites and guestrooms feature 25-inch color televisions with pay-per-view movies, HBO, ESPN and CNN; refrigerators and coffee makers; hairdryers; irons; and direct dial phones with data port and voicemail. The hotel also provides microwave ovens on request. There is a spa to pamper your body and soul; and a tropical outdoor swimming pool to relax. Exercise enthusiasts would love its fitness facility. Beautiful grounds of the hotel are ideal for corporate, social and wedding functions. Proud Marys, an award-winning restaurant, is a favorite eatery of both visitors and locals. Guest laundry facility is located within the premises for added convenience.